Team building drum circle workshops are dynamic, energizing sessions that combine drumming and experiential exercises to grow cooperation and rapport among your team members. Your Drum Circle Workshop will be super-fun and energizing, beginner-friendly, interactive, moderately physical, and can focus on a particular theme. The purpose is to help position your team to move from great to extraordinary. The average workshop time is from 60 to 180 minutes, depending on the package. The session can include a short bio break, depending on the session length. 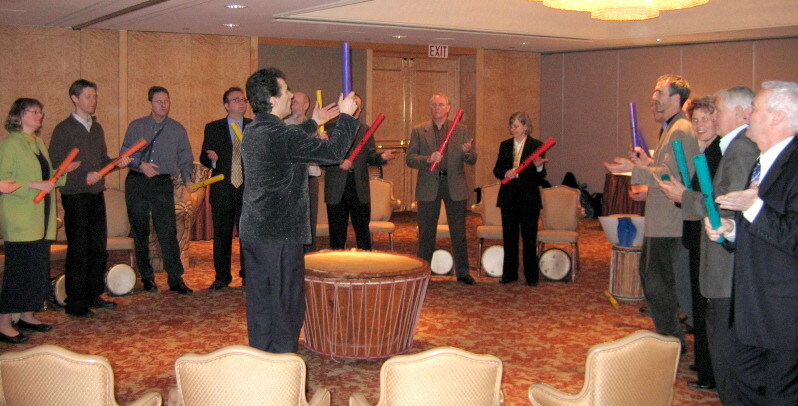 Each of your team members get to play a drum plus a wide assortment of percussion instruments from around the world. They’ll learn basic drum sounds and together as a team we’ll create a strong musical foundation upon which we can build beautiful, complex and fun rhythm. Built into each unique session are interactive elements that may translate into better performance, reduced costs, greater success achieving or exceeding goals, and even increased profits. These things become more possible because team building workshops foster better communication, re-forged teams, and effective listening. Participants report tighter collaboration and committed cooperation, stronger leadership and self-initiative, with team members feeling less stressed out, totally revitalized, energized, and more personally powerful. Add on our exclusive Identity Booster Process, an add-on module specifically built to enhance your team’s sense of its own power, creativity, and capacity. Turbocharge your team and enhance long term positive team outcomes. Add on Values and Vision to tighten individual connection and commitment to your organization's guiding principles and direction. Values and Vision is an add-on module that clarifies and infuses with emotion and fun your organization’s key goals and cultural principles to inspire teams to their their most extraordinary potential and leads to opening doors to significant opportunities. Add on Re-minded, Re-Energized, Repeat! 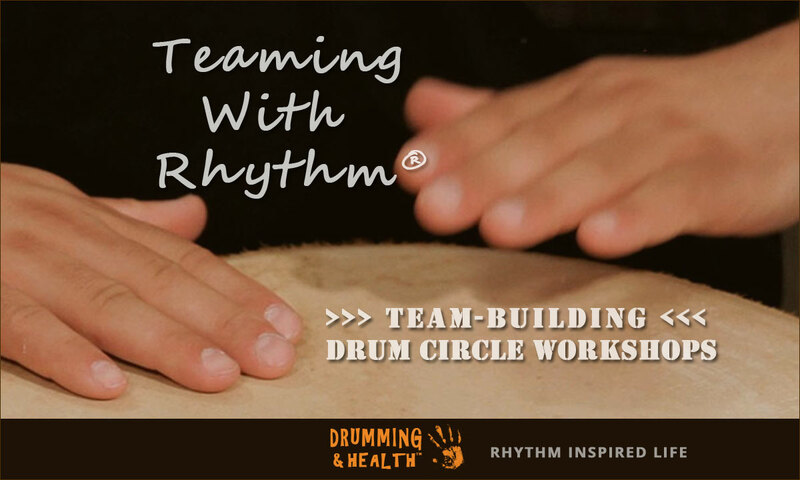 Series Get the power of our Team Building Drum Circle Workshop Repeat Series and Save 25%! After their first taste of team building in a drum circle workshop, teams tell us that they want a way to maintain their power and cohesiveness for the rest of the year to ensure they meet or exceed their own goals. Now your organization can have regular workshops at your workplace and get a significant savings for bundles of sessions. These mini-workshops are variable in length and strategically scheduled for when teams tend to be less productive. B﻿etter performance, reduced costs, greater success achieving or exceeding goals, and even increases in profitibility comes when organizations focus on improving their team dynamics and investing in their staff. 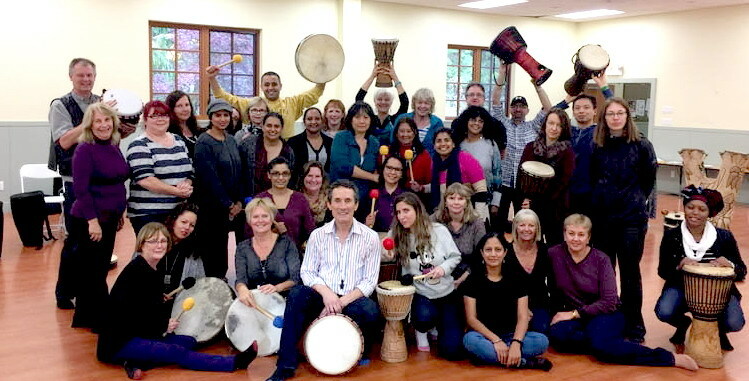 "Drumming brings cohesion and warmth ... it brings people into their own self and creates magic ..."
Team Building Drum Circle Workshops enhance the sense of community and connectedness between individuals and groups within your organization. "A-MA-ZING!! Thank you for awakening my primal beat!" "The most fun ever at a Lunch and Learn - enjoyed the stress relief through music." "Excellent performance and great session - keep it up!" "Thank you so much! What an amazing experience! It really ties everything together for us." "I found the experience very energizing and invigorating ... the best team activity I've participated in ... I got to see sides of some people I never imagined." "Over the past several years, I have had the pleasure of being involved in several experiential learning events facilitated by Lyle Povah. These included: a fireside celebration for a couple of dozen educators, a team-building session with 130 senior bank executives and a fundraising dinner involving several hundred participants from all walks of life. Regardless of the nature and size of the event, Lyle has never failed to deliver a truly unique, extremely memorable, and immensely powerful experience." 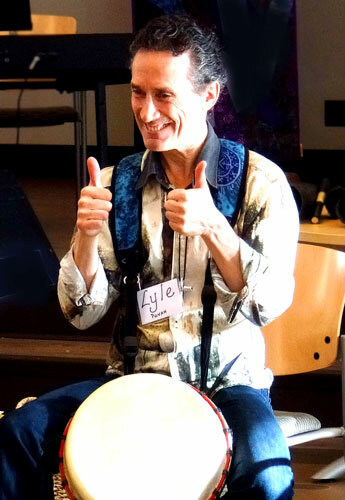 "Recently, our organization was extremely fortunate to experience a drum circle workshop led by Lyle Povah. Inspiring, healing, relaxing, motivational are all descriptors that come to mind when reflecting on the experience. Lyle's exceptional musical and facilitation skills helped create a comfortable, positive and relaxing environment that allowed our staff to open up, participate, enjoy and grow within their personal comfort zones and beyond. Thank you again for a great session and I'm looking forward to experiencing more in the new year." This is THE place for Team Building Events Vancouver!